Weddings are notorious for their toasts. In fact, many couples are now buying commemorative champagne glasses etched with hearts, their names, or other designs. 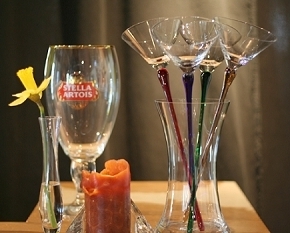 There are many different ways you can serve drinks at your reception. First, and most expensive, you can have an open bar. This means that the bar will be available to guests for the whole duration of the reception. Generally, with an open bar, guests will be able to get any drink their hearts desire (and how ever many), so it can become quite an expense. The second idea is to have a limited bar, which is much less expensive. This can be taken in two ways, you can either have a limited amount of time for guests to get drinks, or you can have a limited variety of drinks, or both. The third option is to have a cash bar, which makes the guests pay for any drinks they get. This is not recommended no matter how tight your budget is. The last idea is to not have alcoholic beverages at all. This will really decrease your reception costs and is a great option if you and/or your families do not drink. For all of you couples who do choose to have alcoholic beverages, you may be confused about how much you actually need to get. Below are amounts for various drinks, based on an amount of 100 guests. If you are going to be serving many different drinks, you’ll want to split these amounts accordingly. You’ll want all of the guests to at least have some kind of drink for the toasts. The most popular choice is champagne with wine close behind. Some couples will choose to have the “bubbly” effect without the alcohol and simply use sparkling cider. If you are having a daytime or casual wedding, you may choose something a little more fun like cranberry juice or lemonade. Just make sure you take into account the style of the wedding as well as your own personal tastes when choosing drinks for your reception.